15 Now Tacoma activists. They come from all walks of life, but all are from a working class background. On May 1, 15 Now Tacoma organized a May Day rally that was well attended. Its militancy caught the attention of the Tacoma Chamber of Commerce, which held a meeting in which they showed a video of the militant speech of one of the leaders (Mike Ladd). This was used to scare the Chamber’s members into pressuring Tacoma Mayor Strickland to put together a task force in order to create a weak alternative to the real 15 Now initiative. In other words, realizing that the initiative might pass, and afraid of the militancy that the campaign might unleash, they accepted that some sort of weak compromise might be necessary. Disgracefully, the leadership of the two locals that have the most low wage workers in them – UFCW 21 and SEIU 775 – have been the most outspoken in opposing 15 Now’s Initiative One. Adam Glickman, secretary-treasurer of 775, explains. ““We would prefer to try to work together with the business community and nonprofits and other stakeholders.” Knowing the history of the UFCW, which lionizes employers at its meetings, another factor almost certainly is that they don’t want to upset the supermarket chains with whom they have contracts that call for far less than $15/hour for many of their members. These corporate union leaders argue that Initiative One cannot win and claim that that’s why they don’t support it. But Initiative One has already scored a victory in forcing the mayor to put forward some sort of minimum wage increase (Initiative 1b), no matter how weak it is. If the union leadership were to really mobilize to fight for it, Initiative 1 would sweep to victory. More important, it would be an important step towards building a real worker fight-back. But that’s exactly what they are afraid of. The stronger the campaign for Initiative 1A, the stronger will be the pressure on the union leaders to break with the employers (including the Chamber of Commerce) and their party – the Democrats. On Oct. 21, the King County (Seattle) Labor Council voted unanimously to endorse measure 1A. Coming just two weeks before the final vote and after the mail-in ballots to Tacoma voters were already mailed out, this was largely a symbolic vote, although it was better than nothing. Even that, however, was too much for socialist city council member – and delegate to the labor council – Kshama Sawant, who made sure to leave the meeting before the issue came up for a vote. She did reportedly say, however, that she didn’t support the measure in Tacoma because it is “fatally flawed”, and doesn’t have the forces on the ground to win, thus repeating the claim of the union leadership. A secondary reason probably is that 15 Now Tacoma is the only branch of 15 Now nationally that is not controlled by Socialist Alternative. * Their concern for their own organizational interests overrides the interests of the workers’ movement as a whole. 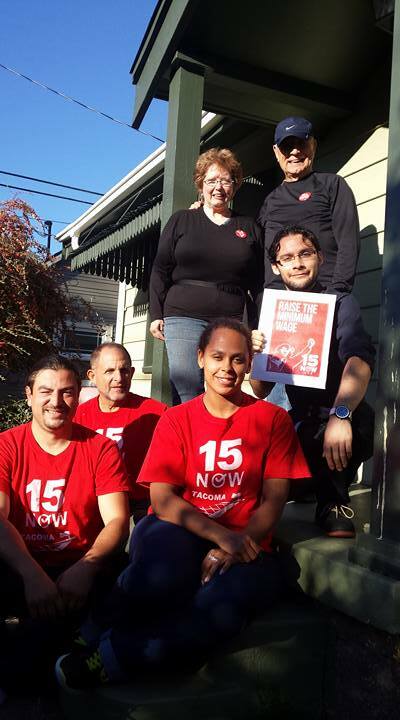 Sawant and Socialist Alternative hung their hat on the slogan “15 Now”, and in the one instance that that has a possibility of becoming a reality, they cut and run because union leaders like Glickman and Rolf want to protect “their” employers. This is socialist politics? No wonder 15 Now Tacoma leader Mike Ladd calls this a “betrayal”. * – Since this piece was written, this statement has been corrected. See the comment below. Well, she did have another fundraiser to attend to at 8:00 PM, so I suppose that is an excuse to leave before the vote, which took place at 7:45. It was a forgone conclusion that the endorsement was going to pass. The Executive Board had already approved it. It was a no brainer, and flew through without discussion. There was no reason she couldn’t have gotten to her fundraiser a few minutes late. Given that she had consistently ducked the issue, and given that Socialist Alternative has seen to it that 15 Now nationally has a news blackout on Tacoma, and given her comments about the Tacoma initiative being “fatally flawed”, and given that it would have been extremely embarrassing for her to have been the only vote against endorsing, I think it’s fair to conclude that she left early to avoid having to vote. 15 Now Oregon and 15 Now PDX (Portland) also aren’t controlled by Socialist Alternative at all. Only a small few of their volunteers are even SA members, and none of the really active members are in SA. 15 Now Oregon is part of a coalition that is running a ballot measure campaign to make Oregon the first state to win $15, and it is now being undercut by some campaign that calls itself Raise the Wage Oregon that, like in Tacoma, is being led by UFCW, SEIU, and others such as AFSCME. 15 Now Oregon and all of its chapters (15 Now PDX, 15 Now Eugene, 15 Now Southern Oregon, 15 Now Coos Bay, 15 Now Eastern Oregon, 15 Now Washington County, 15 Now Salem, 15 Now in the Gorge) are also not controlled by Socialist Alternative. Not in any way, shape, or form. Thank you for this information. Maybe it would be useful for people in 15 Now Oregon to exchange information, experiences and views with those in 15 Now Tacoma.